For this project, you’ll be delving into the world of the extra-terrestrial – or, at least, writing a program that makes it look like it. You’ll learn how to build some sweet sounds that could have come from a UFO or an alien spaceship. This is perfect for people easily freaked out by any mention of aliens or extremely boring teachers. The wiring for this project is the same as in your first project, the ticking clock. 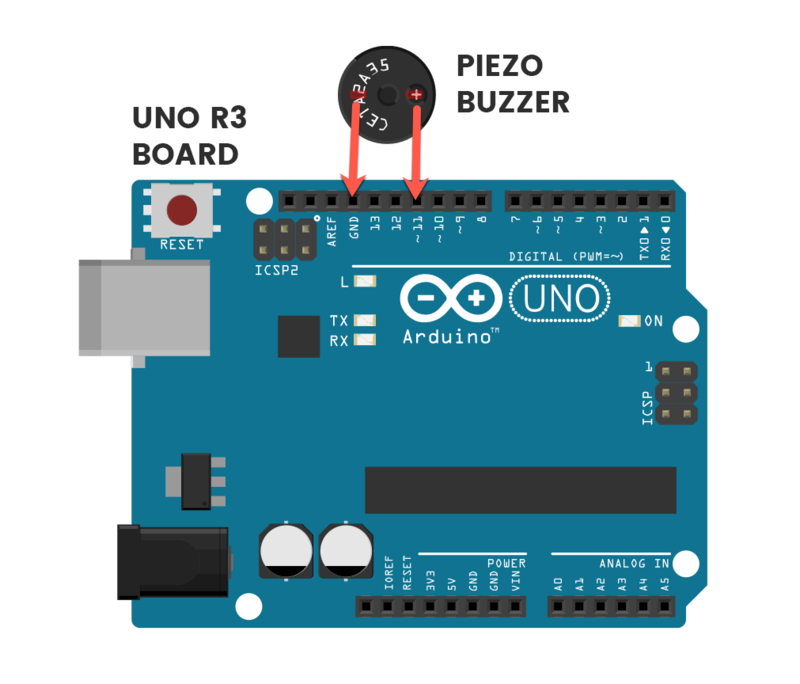 All you need to do is slide the buzzer pins into the Arduino – the positive leg should go in PIN 11 and the negative leg should go in GND. This is the positive leg of the buzzer. It will have a ‘+’ sign on top of it and will also be longer than the other leg. Don’t forget to plug the board into your computer with the included USB cable. Here’s the code we’ll be using to program this invention. I want to change. . .
Have a play around with this value and try to find the most annoying number. Note that any number over 32 will not work, but apart from that, have fun! At the moment, the ‘alien’ beeping is just a fast jumble of random tones. Fancy making this jumble more hectic? Want to slow it down just a notch? Line 4 is where you can change this and set exactly how long each beep goes for. In the demo program, the beep length is set to 10. If we decrease this number, our beeps will get shorter and sound more jumbled. A good number to try to test this is 1. If we increase this number, our beeps will get longer and will sound less and less like alien signals – though still equally as annoying. Another good number to try is 25.